This post was sponsored by Benihana. The opinions expressed are the author’s own. Remember when I participated in Benihana’s “Be The Chef” program? In addition to learning how to make fried rice and onion volcanoes, the friendly staff taught me a bit about Japanese culture, too. Here are some tips that will be handy for your next visit to Benihana and things to keep in mind if you travel to Japan! (my husband Charles and I are heading to Japan on Saturday, so this article is well timed). 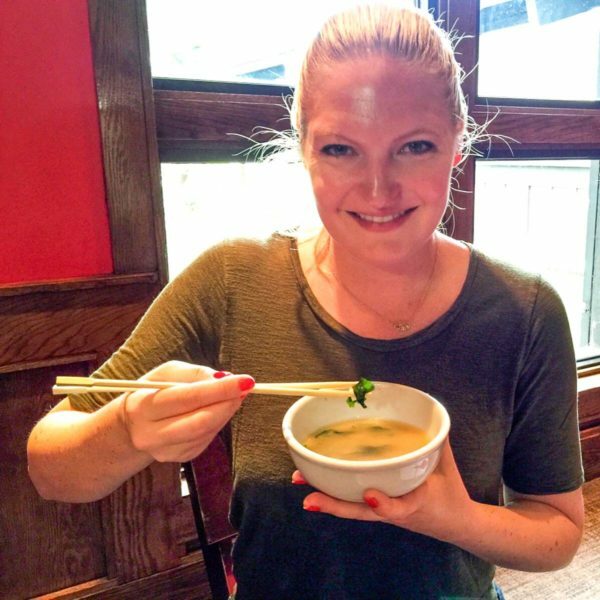 I went to the Benihana in Lombard (it’s just about 40 minutes outside of the city), and after my cooking experience, I got to learn a bit about Japanese culture. There is an emphasis on hospitality and manners in Japanese culture. The Japanese bow when they meet someone. The deeper the bow, the more respect they are showing. When people enter a restaurant or shop in Japan they will be greeted by someone saying “Irashaimase” and bowing. 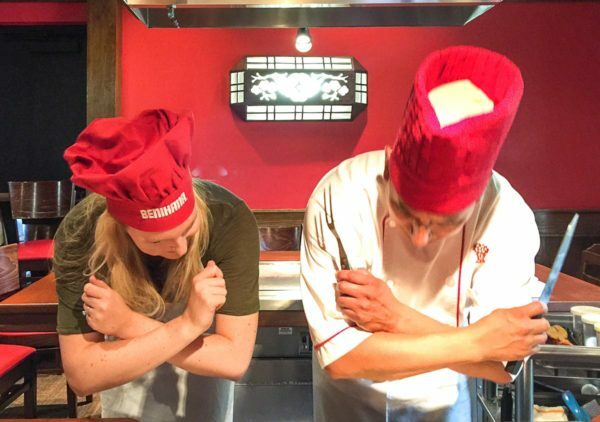 Before the chefs at Benihana begin to prepare your meal, they bow in front of their guests as a sign of respect. There are couple little etiquette rules to know about chopsticks. Grace, the General Manager at Benihana in Lombard, showed me the proper way to hold chopsticks (above). 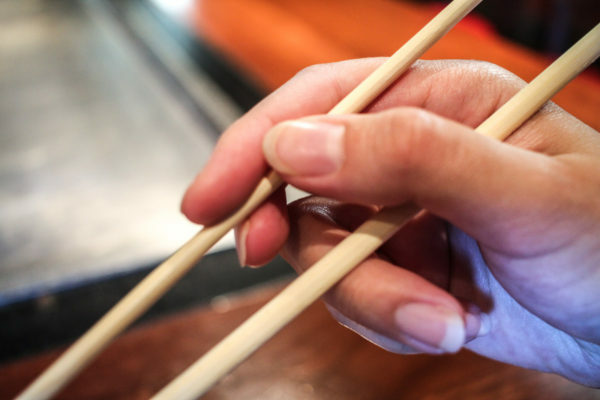 Use your index and middle fingers to pinch the top chopstick, using your thumb to hold it in place. Then hold the second chopstick with your thumb and ring finger. The top chopstick moves to pick up food, which the bottom chopstick stays still. It’s considered rude to place your chopsticks in your food so that they are sticking up. This is how rice is offered to the spirit of a dead person and should not be done at the table when eating. And never pass food chopsticks to chopsticks of others. This act is done during Buddhist funeral ceremonies and shouldn’t be done with food. Instead, use chopsticks to place food on a plate to share with others. When it comes to eating soup, the Japanese use chopsticks to eat any solid food in the soup. For example, you can eat the kelp and tofu in miso soup with chopsticks, and then pick up the bowl to drink the broth. Spoons are offered in more modern restaurants, but it is still acceptable to pick up the bowl to drink the broth. 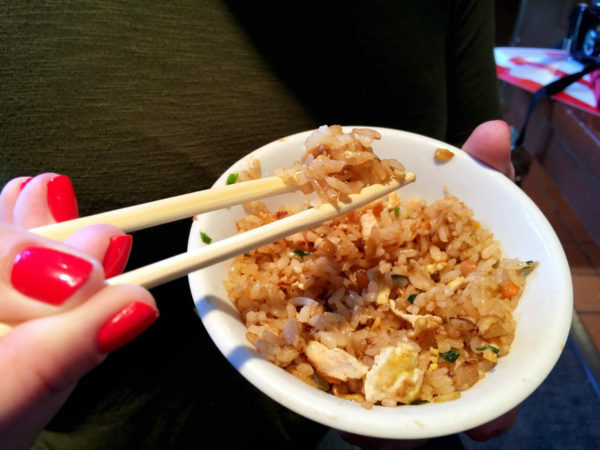 To eat rice, it’s common to hold the bowl close to your face and then use the chopsticks to carry the rice quickly into your mouth. This is definitely an easier way to make sure that the rice doesn’t spill everywhere. Do you have any Japanese cultural information to add? I would love to hear your thoughts in the comments!